I hope you like the new look website and blog combined. I’ve even managed to include a link to my own personal family history pages! It’s been frustrating me that they were all on separate sites, and all looked different. Now at least this website and my blog have the same “look and feel”. My personal research pages still look different, but at least they’re linked from here now. If you look at the footer of this page, you’ll see that I’m now using WordPress to publish everything. I’ve got to say that I’ve been very impressed with how easy it was to set everything up. It’s taken an afternoon’s work to do a test install of the software; a final install; convert my old website and import my old blog postings and comments. Before you start to wonder – no, I’ve no connection at all with WordPress – I’m just an impressed new user. If you’ve ancestors from Stirling you might find this useful. The Old Town Cemetery in Stirling has just undergone a £1.7 million refurbishment. The Old Town Cemetery is at the Top of the Town in Stirling, just below the castle and the Esplanade of Stirling Castle forms its Eastern boundary. Author sheenaPosted on July 10, 2009 October 28, 2009 Categories Odds & ends, ScottishLeave a comment on Stirling ancestors? 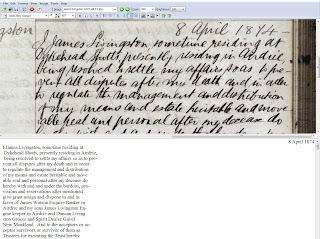 It’s called Transcript and displays the digitised image in the top half of the screen and an RTF text editor in the bottom half so it’s far easier to transcribe. You can even set it up to scroll down the image automatically every time you hit the “Enter” key or as the text wraps at the end of each line. Guess what I’ve been doing today! And I’ve got a meeting in London tomorrow, and another commitment tomorrow night – rats! On April 1, the final tranche of the old parish registers, death records for the period 1553-1854, will go online. Hurrah! Guess what I’ll be doing on Wednesday! Indexes to, and digital images of, the records held by London Metropolitan Archives have started to appear online at Ancestry. The whole collection spans over 400 years from the 1500s to the 1900s and covers parish baptism and marriage registers, burial registers, Bishops’ Transcripts, Non-conformist baptisms, marriages and burials, poor law Board of Guardians records, school admissions and discharge registers, electoral registers and poll books, land tax documents, Surrey marriage bonds and allegations, wills, transportation records from the Middlesex Sessions of the Peace, Diocesan marriage bonds and allegations, Diocesan divorce exhibita and City of London Freedoms. The full collection is due to appear gradually over the next year. You will need either a premium or worldwide subscription to view the data. An Italian family is searching for relatives of a British soldier who saved their mother’s life during WWII. In January 1944, the pregnant Maria Mancini from the Abruzzo region of Italy needed emergency medical treatment to save her life. A British soldier called Martin drove her to hospital in his jeep through snowstorms and across mined roads. After an emergency cesearian section, Mrs Mancini gave birth to twin girls. Sadly one of them died a week later. Martin continued to visit Mrs Mancini in hospital, they became friends and he gave her a photo of his own two daughters. Just after Mrs Mancini and her daughter were released from hospital, Martin was killed in action. Mrs Mancini remembered and often told the story of Martin’s kindness and friendship to her family. Unfortunately she never knew his surname. Her daughter, Angela, and her granddaughter are now searching for the two children in Martin’s photo. and you can see the “teasers” about them on the series’ website at http://www.bbc.co.uk/whodoyouthinkyouare/ Past series have managed to find a celebrity to fit into the English, Scottish, Irish, Afro-Caribbean, Asian, Military, Jewish and aristocratic research categories. Who’s going to fit into each slot this time? And will this new series lead to a further flush of enthusiastic newcomers starting to research their family trees? The world of online genealogy has changed dramatically since the first series, broadcast in 2004, caused delays to the GRO’s online ordering service and the amount of media coverage given to the commercial outfits has grown. But what about the family history societies? In theory the big Who Do You Think You Are? Live show at Olympia at the end of February should help them tap into this new audience, but in practice the number of “traditional” societies attending seems to be declining. Gossip suggests that this is because the costs are too high. How can smaller societies connect with new researchers? What is your society doing? Should they even try?